I download so many free Line stickers today with FlyVPN. It’s about 15 sheets sticker. Those stickers are so cute. Make funny with Line stickers. 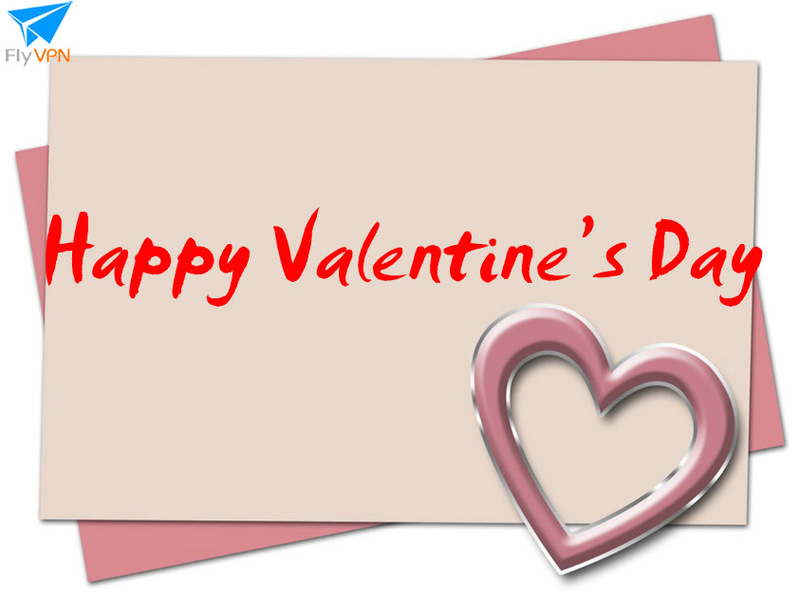 Let us know more about free Line stickers on 3/04/2014. 1. 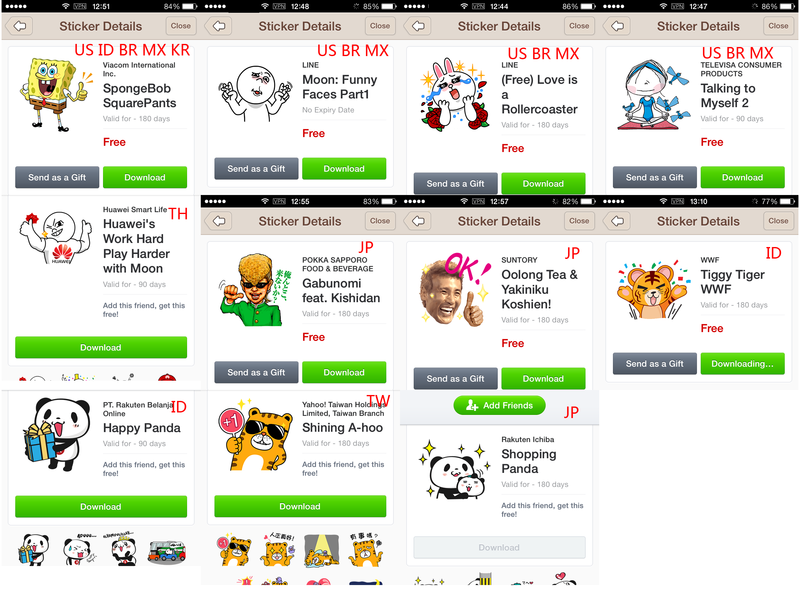 Free Line Stickers In US Stickers Shop. Moon: Funny Faces Part2 (line://shop/detail/1732). Connect to USA VPN to access US stickers shop. 2. Free Line Stickers In TW Stickers Shop. Food123 (Lion & Squirrel) (line://shop/detail/1751). Connect to Taiwan VPN to access Taiwan stickers store. 3. Free Line Stickers In Malaysia Stickers Shop. Connect to Malaysia VPN to access Malaysia stickers shop. 4. 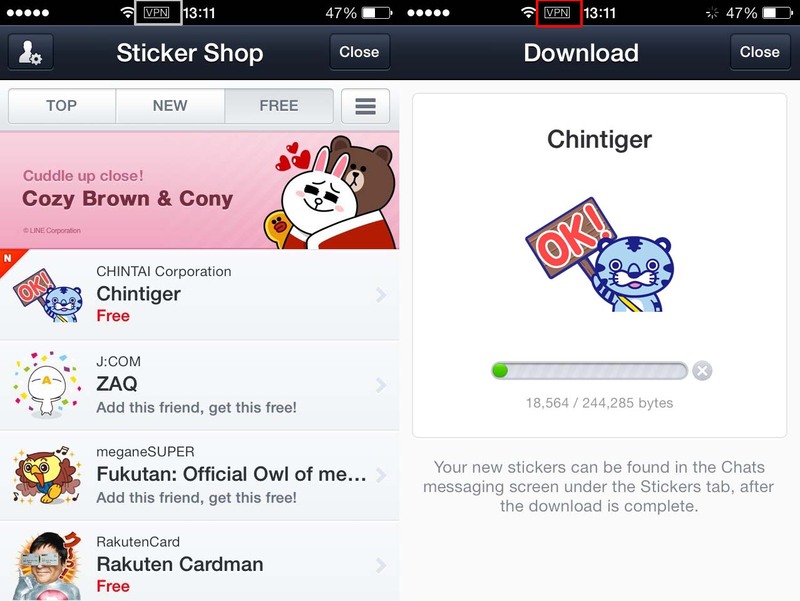 Free Line Stickers In Indonesia Stickers Shop. Connect to Indonesia VPN to access Indonesia stickers shop. 5. Free Line Stickers In Japan Stickers Shop. Shinkenzemi Senior High School Course (line://shop/detail/1792). Shop Smarter with LINE Sale Stickers (line://shop/detail/1793). Connect to Japan VPN to access Japan stickers shop. 6. 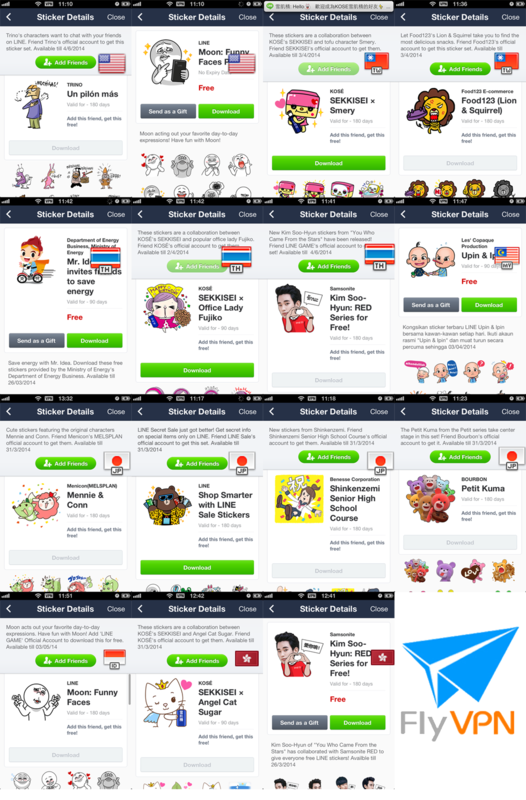 Free Line Stickers In Thailand Stickers Store. SEKKISEI × Office Lady Fujiko (line://shop/detail/1768). Kim Soo-Hyun: RED Series for Free! (line://shop/detail/1746). Connect to Thailand VPN to access Thailand stickers shop. 7. Fre Line Stickers In HK Stickers Store. Kim Soo-Hyun: RED Series for Free! (line://shop/detail/1744). SEKKISEI × Angel Cat Sugar (line://shop/detail/1767). 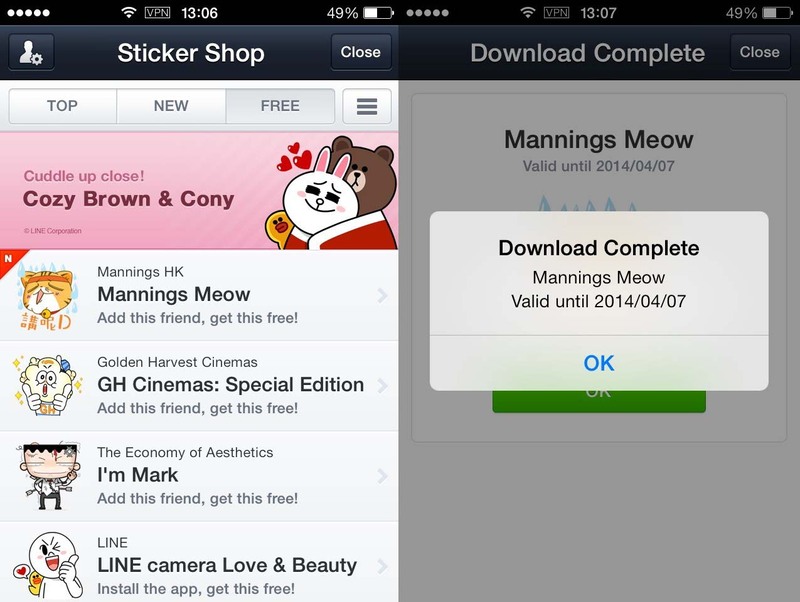 Connect to HK VPN to access HK stickers shop. Please read intructions below to download free Line Stickers from other countries’ sticker shop with FlyVPN. I know many users want to trial VPN services to download free Line stickers. If you are so idle, maybe you must have to spend several hours to download those stickers. 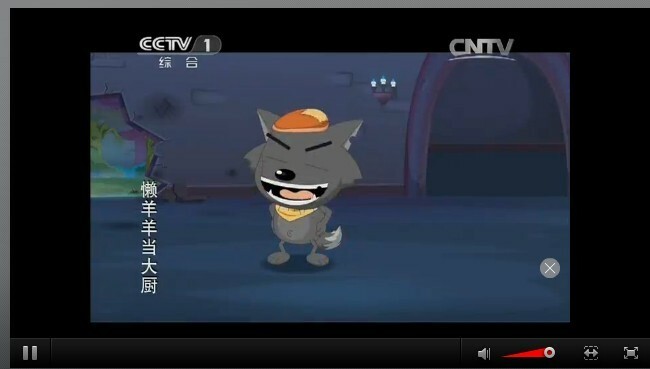 FlyVPN has many VPN servers, covers most of countries of Line event. So FlyVPN is the best choice for trial or paid VPN users. 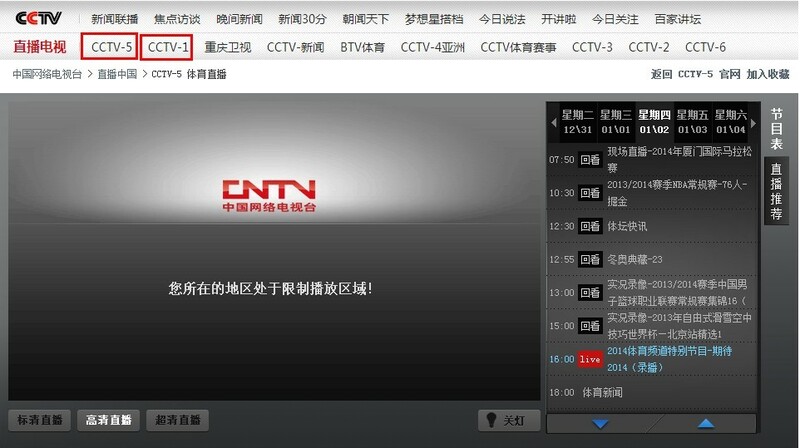 As I know that trial users can only use FlyVPN for 3 times per day. Also users will be disconnected every 20 minutes. Once disconnected, users have to wait 5 minutes. If you want to download those free Line stickers in several minutes without disconnected and wait. Buy paid VPN is a wise choice. You can also share the premium account to your friends if you aren’t rich. 1: Remove phone number from your Line account, otherwise, you can’t access other countries stickers store. Note: all the chat record will be deleted, please back up it before uninstall Line account. 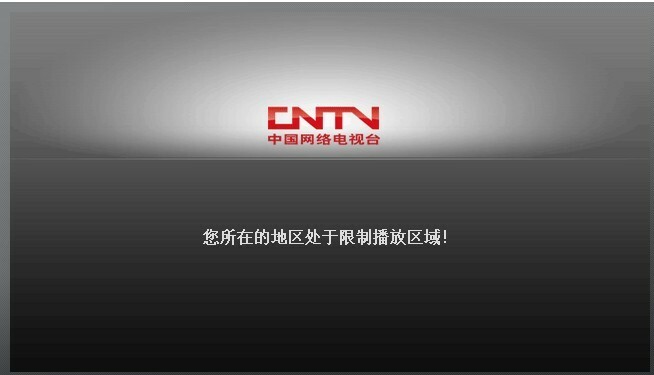 2: Free trial VPN Site: http://www.flyvpn.com/freetrial . 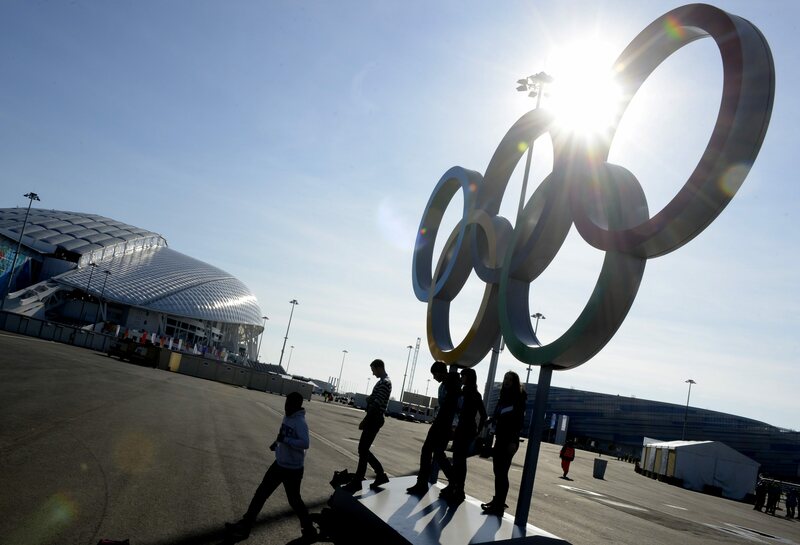 Single IP can use it 3 times per day. 20 minutes per time. PS: This video created by KP Yin on YouTube.